DETROIT -- Some analysts wondered why sales of the subcompact Ford Fiesta sank 44 percent in April, while sales of its big brother, the compact Focus, jumped 13 percent. Is the Fiesta sinking? No, says Erich Merkle, Ford's chief sales analyst. It's a case of two cars finding their natural sales levels after Focus inventories dropped sharply in the spring and summer of 2011 during the switch from the 2011 Focus to the redesigned 2012 model. During April 2012, Ford sold about four Focuses for every Fiesta, a level that's likely to continue, he said. Merkle will have more to say about the two cars Friday morning when Ford issues its May sales numbers. 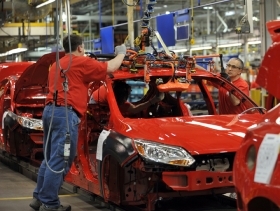 "Fiesta benefited by default" because dealers hadn't yet built up stocks of the 2012 Focus last April, Merkle said in a conversation with journalists earlier this week at Ford's world headquarters in Dearborn, Mich.
Now it may be the Focus' turn to feel the heat. Ford will introduce its mid-sized Fusion this fall, part of an industry onslaught of mid-sized sedans that also includes the new Chevrolet Malibu, Nissan Altima, Honda Accord and Toyota Camry. These new models are expected to pressure entrants in the compact segment. "The differential between compact and mid-sized vehicles is going to close dramatically" in terms of fuel economy, Merkle said. "I would expect compact cars will remain relatively flat around 20 percent [of U.S. sales], while we may see mid-sized cars move higher." Meanwhile, the improving housing market has given a boost to pickup sales, Merkle said. Home starts were up 30 percent in April and around 24 percent for the year, he said. Full-sized pickup sales, Merkle said, accounted for 10 percent of U.S. industry sales last month, up from April 2011's 9.2 percent, and they approached 13.5 to 14 percent in December to nearly match their peak years in 2005 and 2006. Merkle said pickup sales tend to be strongest in the second half of the year. The popular F series sold 191,280 units through April, up 11 percent from the same period last year. "We have seen increases in pickup truck sales. We saw them last year and we're seeing them again now," Merkle said. "That market continues to grow."